Roberta and I have encouraged our customers to send us photos of their projects. We hope more of our customers will send us photos of their quilts. 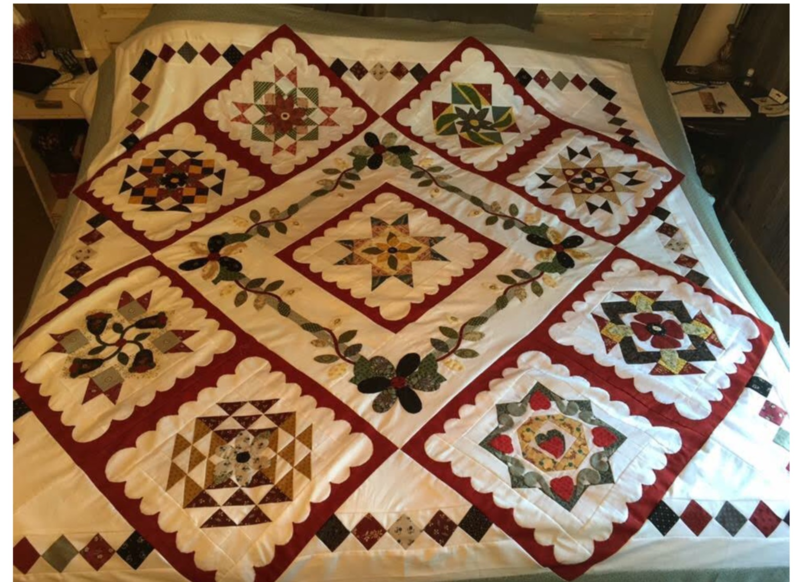 Below is a quilt made by Two Bees Fabric customer Lori Mosley of Eustace, TX. It is just really beautiful and sure looks like a lot of work !! This was the Kansas City Star block of the month for 2015. Thank you again so much for all of your help in getting the fabric that I needed to make my first quilt or! Or should I say the first quilt I started. I actually ended up doing four other quilts while I was making this one lol. It took 18 months to do this quilt. I just love the Civil War era fabrics! Another customer made a lovely dress!!!! Absolutely beautiful!! The fabric is from the Victoria Park collection by Karen Styles for Marcus Fabrics. A quilter would have used the fabric for a beautiful border, but a dressmaker made a lovely dress with it!!! I want to go there!!! Ya'll Google it.......fascinating! !